Whether it’s for business or pleasure, the right kind of van should always strike a balance in efficiency, comfort, and power. Better said or written than done, considering the various scenarios vans face when being on the road! The first thing that one may see when the Nissan NV350 comes to mind is on how clean-cut the vehicle is. No frills, just sleek and a fine basic design that can also result to an appealing aesthetic appearance – that’s what the Urvan has to offer! Yet, even with its conventional exterior, the Urvan does have subtle design accents that will treat those lucky to notice them. The front radiator grille, which has the Nissan company logo placed upon front and center, is a mix of stylish form and function. This is because the lower part of the grille is smartly designed with blades, offering smooth airflow for an aerodynamic drive. 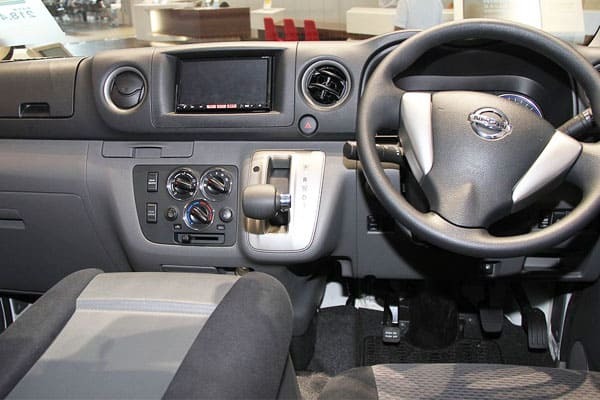 More on combining the best of style and function, almost each part of the Nissan Urvan will serve the driver well. The halogen headlamps, which provide a clear and visible approach on any driving condition, are also perfect design accents for the Urvan’s exterior design. The rear doors, which slide seamlessly for easy access and loading, are also designed to give a unique and functional look that everyone would truly appreciate. Inside, the spacious seating and luggage capacity that the Urvan provides is already a stylish factor to appreciate. Ergonomically key features (which we will be discussing more below) allow one to see more on how beautiful this van is. Also, and just like the van’s exterior design accents, the Nissan Urvan’s interior beauty lies with the functionality factors within. This can be best observed with the Urvan’s dashboard: simple as it is, with the tachometer, speedometer, odometer, and various drive displays ready and accessible, the no-nonsense design is already a design accent that’ll treat anyone’s eyes. 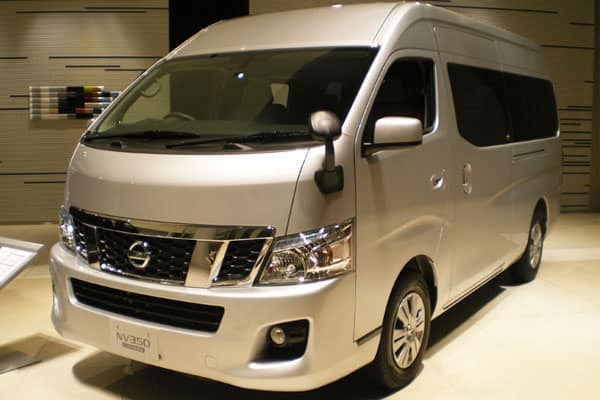 No matter the situation may be, whether it may be for long family drives or multiple driving routes as demanded for a passenger vehicle, the Nissan NV350 Urvan is properly equipped with the power to deliver. A 2.5-liter inline and 4-cylinder DOHC diesel engine provides the needed oomph to get people and cargo to their destinations in a quick, secure, and safe manner. In terms of power output, the powerhouse that the Urvan contains can result to 129 PS (3200 RPM) and a peak torque of 356 Nm – definitely a force to reckon with! The Urvan’s 5-speed manual transmission provides drivers maximum control – just perfect to provide that perfect balance of performance, safety, and efficiency. Also, which comes as a welcome surprise, the Urvan’s manual transmission system is also equipped with a Shift-Up Indicator – a great system to maximize fuel economy during every drive. Speaking of safety, another high-performance asset that the Urvan is equipped with are its brakes. An active braking system, which combines the best of front ventilated disc brakes and rear drum brakes assures drivers that every ride is secured. To complement the already impressive braking system, the Nissan Urvan’s suspension system is designed to provide the best control for the driver to have. 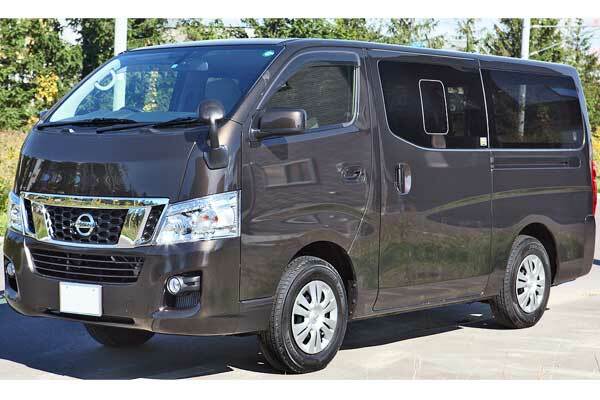 As we’ve mentioned earlier, we’d like to take the opportunity to discuss more on why the Nissan NV350 Urvan is the best vehicle to treat passengers for a ride in. The Urvan comes with a basic stereo system, which, when making use of the 4 speakers located at each corner of the vehicle, provides a fun way to pass time during long trips. Also, safety is always prioritized in the Urvan: 3-point ELR seatbelts allow passengers to have the peace of mind that they are secured during even the roughest road conditions. Additional safety features are available for the driver and his or her front-seat passengers. Pretensioners, which adjust in cases of accidents, allow individuals to have some semblance of movement during these dire situations. Front airbags (SRS, or Supplemental Restraint System) are triggered in cases of accidents, allowing one a higher chance to prevent injury from impact and the like. 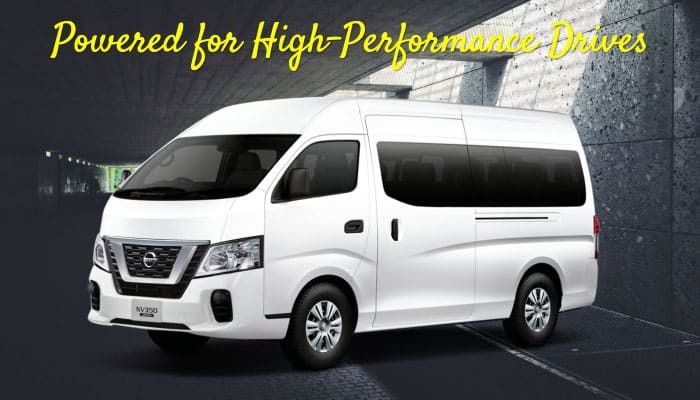 The Nissan Urvan’s spacious seating and load capacity already brings a sense of comfort to one’s being – additional comfort factors that the car provides are indeed welcome surprises! The van’s powerful and efficient air conditioning system provides everyone the opportunity to cool off on even the most hottest days of the year. With air conditioning vents conveniently located in the front and rear positions of the vehicle (plus 12 individual vents in the headliner), trips are definitely more comfortable and cooler! The Nissan NV350 definitely delivers whether it is for personal or business driving demands. The spacious capacity and power that the van houses provide everything needed for safe and comfortable rides. Make sure to ask the nearest Nissan dealership for more details on this wonderful vehicle today!